XAP is an accelerated professional development program for women that boosts women's confidence, strategic focus and key business skills by using practical action steps in a relaxed environment. It starts with a Kickoff Session in Boston, followed by eight weekly, online group sessions and ends with a Graduation Retreat in Boston. All with NO time away from work. Class meets ONLINE on THURSDAYS (Session 1: 7-8 pm EST or Session 2: 9-10 pm EST). You can call-in from anywhere. All the sessions are recorded in case you miss one and you have lifetime access to the material. Most companies reimburse their employees for this program. This is an 8-Week Online Program for women. It is designed to fit around your schedule. You can do the work on your own time and we get together online on Thursday nights from 7 – 8 pm EST or 9 – 10 pm EST. You can call in from anywhere and these calls are recorded. Fees include a Kickoff Session in Boston, 8-week online program with weekly group calls, a Graduation Retreat in Boston, light meals and all materials. (Hotel and travel not included.) There is also lifetime access to the material. Many companies pay for programs like this. Click here for a sample letter that you can edit and send to your boss to ask your company to pay for this program. We have a limited number of spots available in the program and are unable to give refunds. If a student is unable to take the program, you may transfer their spot to someone else or you may reserve a spot in a future program. 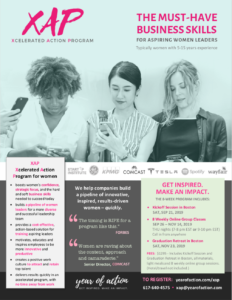 Contact: xap@yearofaction.com for more information. Make this your Year of Action. We can help. Register today to get started.